A framework Chunghwa Telecom ecommerce Public Key Infrastructure (ePKI) was set up by Chunghwa Telecom (CHT). Its purpose is to issuing certificates and strengthen electronic commerce infrastructure. It is the Hierarchy PKI based on ITU-T X.509 standard, within the framework, an ePKI Root Certification Authority (eCA) acts as the trust anchor and issues certificates to subordinate certification authority (CA). There are two subordinate certification authorities, Public CA (PublicCA) and EV SSL CA(ePKI EV SSL CA).PublicCA issues certificates to the general public including natural persons, organizations, equipment, and application software. ePKI EV SSL CA will issue EV SSL certificates to servers of private organization, government entity, business entities and Non-Commercial Entity (International Organizations). eCA and its subordinate CAs have accomplished the annual Trust Service Principles and Criteria for Certification Authorities 2.0 audit and published the renewed Audit Report and Management's Assertions in accordance with WebTrust program. eCA & its subordinate CAs will continue to maintain the validity of Web Trust Principles and Criteria for Certification Authorities seal by complying with WebTrust program. eCA & its subordinate CAs have accomplished the annual WebTrust Principles and Criteria for Certification Authorities – SSL Baseline with Network Security Version 2.2 audit and published the renewed Audit Report and Management's Assertions in accordance with WebTrust program. 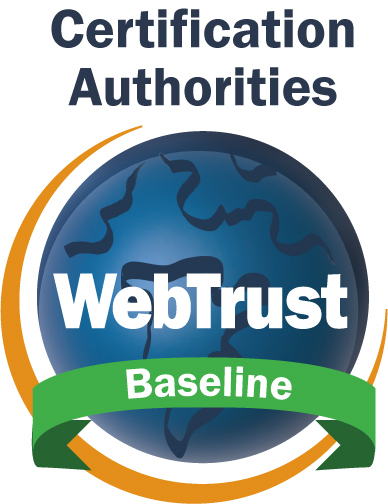 eCA & its subordinate CAs will continue to maintain the validity of WebTrust Principles and Criteria for Certification Authorities – SSL Baseline Requirements seal by complying with WebTrust Principles and Criteria for Certification Authorities –SSL Baseline with Network Security. eCA and ePKI EV SSL CA have accomplished the annual WebTrust Principles and Criteria for Certification Authorities - Extended Validation SSL Version 1.6.0 audit and published the renewed Audit Report and Management's Assertions in accordance with WebTrust program. eCA and ePKI EV SSL CA will continue to maintain the validity of Web Trust Principles and Criteria for Certification- Extended Validation SSL seal by complying with WebTrust program. ePKI CP Version 1.6、eCA CPS V1.5、PublicCA CPS V1.8 and ePKI EV SSL CA CPS Version 1.2 are approved by ePKI Policy Management Committee.